Provides tools that make it easier to validate data using Benford's Law. The Benford Analysis (benford.analysis) package provides tools that make it easier to validate data using Benford's Law. The main purpose of the package is to identify suspicious data that need further verification. To install the GitHub version you need to have the package devtools installed. Make sure to set the option build_vignettes = TRUE to compile the package vignette. 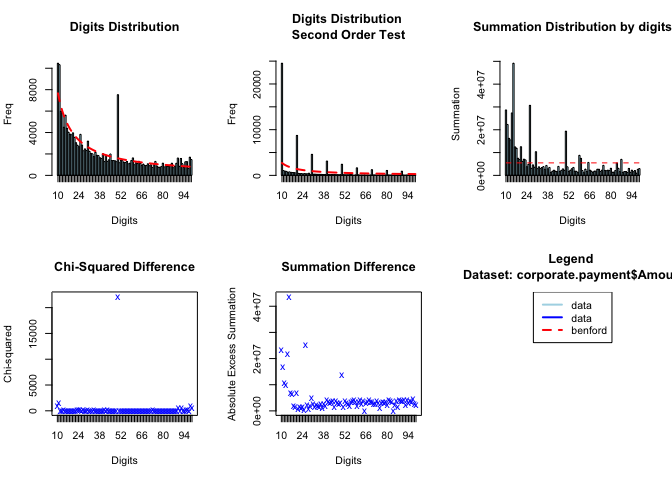 The benford.analysis package comes with 6 real datasets from Mark Nigrini's book Benford's Law: Applications for Forensic Accounting, Auditing, and Fraud Detection. The original data is in blue and the expected frequency according to Benford's law is in red. For instance, in our example, the first plot shows that the data do have a tendency to follow Benford's law, but also that there is a clear discrepancy at 50. #> Remember: Real data will never conform perfectly to Benford's Law. You should not focus on p-values! The print method first shows the general information of the analysis, like the name of the data used, the number of observations used and how many significant digits were analyzed. Printing also shows the 5 largest discrepancies. Notice that, as we had seen on the plot, the highest deviation is 50. These deviations are good candidates for closer inspections. It also shows the results of statistical tests like the Chi-squared test and the Mantissa Arc test. The package provides some helper functions to further investigate the data. For example, you can easily extract the observations with the largest discrepancies by using the getSuspects function. More information can be found on the help documentation and examples. The vignette will be ready soon.